Monotheism means “belief in a single God.” It usually refers to the so-called Abrahamic monotheisms: Christianity, Islam, and Judaism. However, any religion with a single god counts as monotheism. Monotheisms are extremely diverse, having little in common other than the fact that they believe in only one god. Even then, the word “God” can mean an enormous range of different things (or non-things). 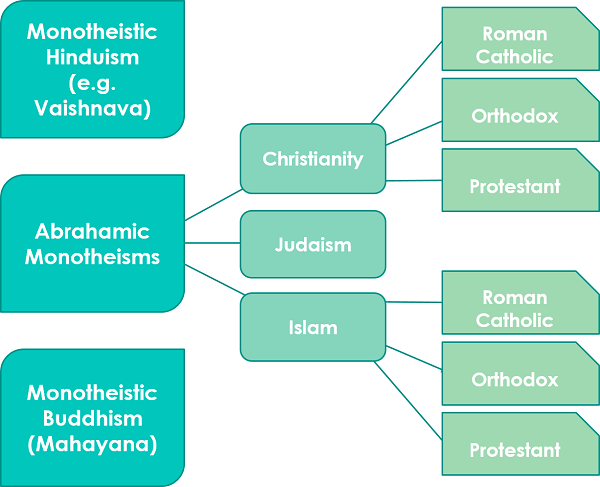 Thus, monotheism is a somewhat vague term, a family of religious sects with certain key attributes in common, rather than a precise philosophical category. There are two main alternatives to monotheism. Polytheism is the belief that there are many Gods rather than just one. In polytheism, people believe that human life and the universe are ruled by several gods — from three or four all the way up to hundreds or even thousands! Usually the different gods are split up so that each one has a different set of powers and responsibilities, for example creating rain, guiding travelers, etc. On the opposite side is atheism, which is a belief that there is no God. Because theists usually base their morality on the existence of God, they sometimes imagine that atheists do not believe in any kind of morality or purpose. But this is untrue — atheists embrace morality and purpose in life, they just don’t believe that these things come from any kind of God. Joseph Campbell was a highly influential scholar of mythology who argued for a complex apophatic position on theism, or the view that God cannot be directly described in language. Campbell argued that theists needed to understand God in terms of a metaphor, not an actual being up there in the sky somewhere. If you really understand the idea of transcendence, he said, you come to understand that God is beyond our understanding, and that means beyond simple words like is and is not. God, he argued, is greater than both existence and non-existence. C.S. Lewis, author of the Chronicles of Narnia, was a devout Christian monotheist. In this quote, he expresses his attitude toward faith and belief. Monotheism, he says, is not something we just accept on the basis of tradition or someone else’s authority, but rather something that gives clarity to everything else in life. The earliest written records suggest that our ancient ancestors were mostly polytheists — they believed in many gods. In many parts of the world, this ancient polytheism evolved into monotheism, though the different monotheisms took many forms. In India, for example, Hindu philosophers argued vigorously about how to interpret their polytheistic religion. Were all the gods equal? Or were some higher than others? Or, alternatively, were all the gods just expressions of a single divine reality, much as some modern-day Christians believe in the father, son, and holy spirit as three parts of a single God? There were many Hindu sects, such as the Vaishnava sect, that argued for monotheism from an extremely early date. Meanwhile, in the Middle East, various clans and city-states adopted individual gods for their societies. There would be one god of Ashur, one god of Babylon, one god of the Hebrews, etc. In this system, people usually believed in the gods of other cities/tribes, but only worshipped their own. The earliest forms of Judaism emerged out of this polytheistic system, and the Jews would eventually give rise to Christianity and, more indirectly, to Islam. The melodic punk band Thrice uses monotheistic imagery in their lyrics, though they are not specifically a Christian band. Lines like this could be taken as expressing various forms of monotheism aside from Christianity. The line about “carbon and chemicals” suggests that there is more to us than just our physical bodies, and that this is somehow connected with an “invisible” God. There are several religions in Game of Thrones. One of them, the religion of the Red Priests, is monotheistic. They worship the Lord of Light and argue that none of the other gods exist. The story doesn’t say which religion is correct, but there does seem to be some truth to the Red Priests’ claims, since they are able to perform all kinds of magic through their religion. In many forms of monotheism, the belief in God is based on faith rather than proof. In particular, many forms of Christianity and Islam (though not all!) emphasize that certain religious ideas have to be taken on faith, for example the belief that God is a single, all-powerful being, or that Jesus or Muhammad were somehow uniquely connected with God. Among the Abrahamic monotheisms, Judaism is unusual in this respect — Jews generally emphasize rituals over beliefs, so there’s not as much need to have “faith” in one’s beliefs. In fact, many Jews are skeptics, meaning they reject faith and believe that all ideas should be intensely examined and challenged by reason. Philosophers are divided over what role faith should play in religion. Many point out that some kind of faith is necessary for life to go on (you can’t prove, for example, that the sun will rise tomorrow, but it seems like a reasonable thing to take on faith). Most philosophers, however, would argue that the question of God is too big and important to take merely on faith. Some other arguments, they say, are needed to justify such a belief. It’s important to note, however, that the idea of “faith” is just as complex and multi-faceted as the idea of “god.” While many monotheists understand faith as a matter of belief, others understand faith in a different way. For them, faith has nothing to do with “believing” that a certain idea is “true.” Rather, faith for them is more a matter of commitment and hard work. So faith in God doesn’t mean you believe God exists in spite of the lack of evidence; faith means you try to live a moral life here on Earth because it’s the right thing to do whether or not God exists. Which of these is NOT a form of monotheism?